Tired of that round and round and round dizzying feeling you get while wrapping your tree trunks with lights? 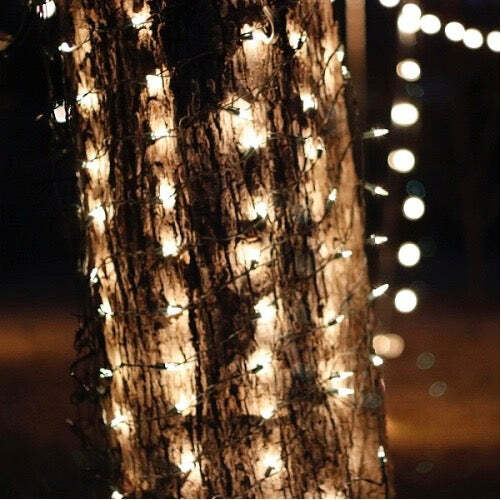 Say goodbye to vertigo with our tree trunk wrap net lights! Trying to find a new way to enhance your Christmas light display? Tree Lights. Each set of these net lights is 20 inches wide by 8 feet high. Your outdoor landscape will become a twinkling forest with these easy to install trunk wraps. Consider also using these simple sets for covering fence posts or pillars on your porch. Net spacing takes the guesswork out of making sure your lights are lined up well and evenly positioned. Maximum sets to use in a series are three. Trunk wrap lights are a great choice for restaurants or malls that want to make a statement to arriving customers. They are approved for both indoor and outdoor use. I purchased these to use on a Big wreath! They worked great for my project! Just what I expected and wanted. Thank you Christmas Light Source! Q: Do you have these in green lights? A: Sorry, we only carry them in white/clear at this time. Q: Hi! I know this says clear bulbs, but I'm just curious if you know if this is a cool white or a warm white? I just can't tell from the pics. Thanks much! A: This net light/trunk wrap has bulbs that are traditional glass with filaments - not LED. So they aren't either warm or cool. Just that lovely warm traditional color of white Christmas tree lights that are transparent with a filament. Q: I'm looking for 12v or 24v tree wrap Christmas lights. Are these low voltage? A: No, I'm sorry, these are 110V/120V rated sets. Thanks for your email - we realized that the specifications on this set of lights were incomplete and we've updated them.